When I eat out, it is mostly to hang out with friends; food is secondary. We’ll try new restaurants (normally hipster-ish) and talk more than we eat. When I do go out for lunch to fill my stomach, I almost always choose Japanese food. The Japanese restaurant in Selangor Club Bukit Kiara is my go-to lunch place. I like that the food is homey, the location is quiet, and the price is reasonable. I’ll normally order salmon shioyaki, beef teppanyaki, or mix seafood set – all which comes with a bowl of chawanmushi. Peculiarly, I am not a big fan of chawanmushi. I always request for it to be changed to agedashi tofu. 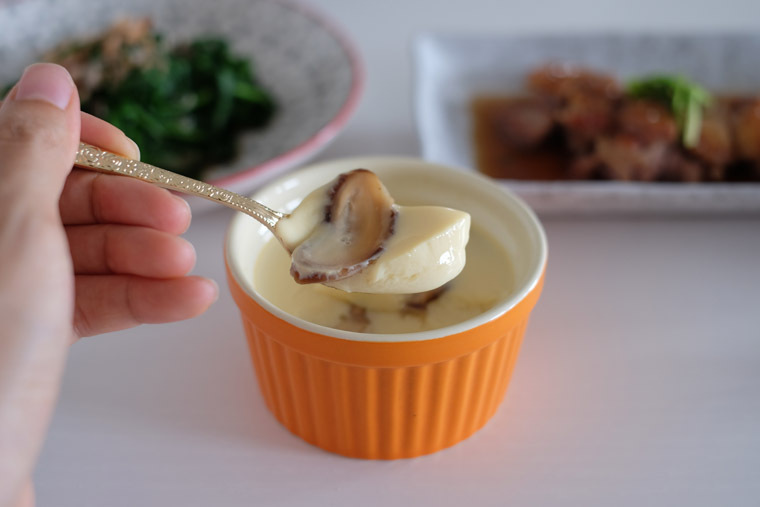 My thoughts of chawanmushi changed when I make it from scratch at home. Homemade chawanmushi tastes so much better. I’ll credit it to concentrated homemade dashi stock and fresh kampung eggs with sunset coloured yolk. Quality ingredients really does make a difference! 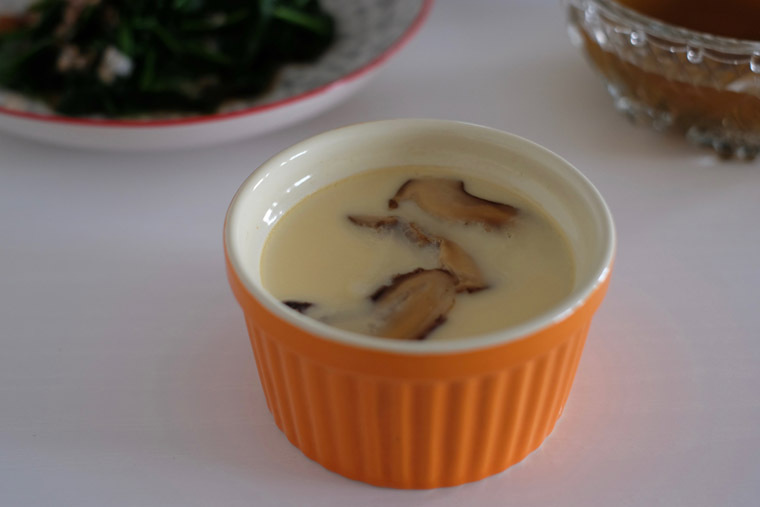 If you like chawanmushi, this is a simple recipe that you could try. If you don’t, do try making this anyway – it may change your mind. The original recipe from a cookbook I bought in Tokyo includes 200 g of soft tofu. 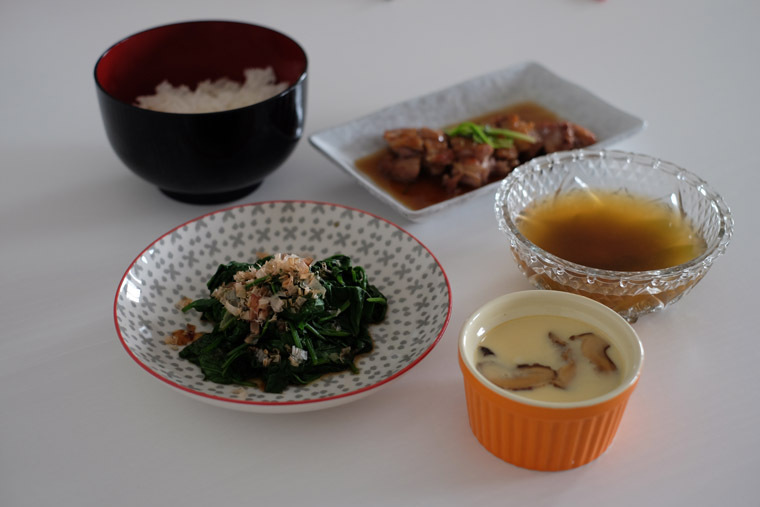 It’s also topped with mitsuba leaf (which can be replaced with coriander leaves) to make it prettier. 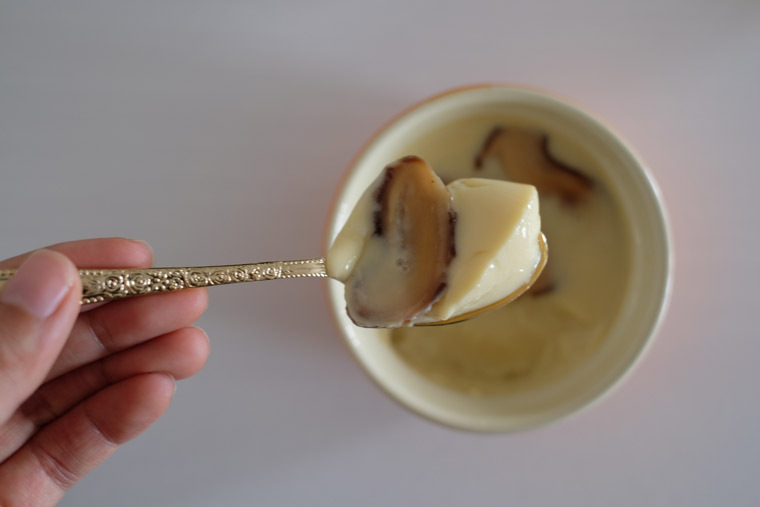 However, I don’t always have tofu or herbs at home, I only use 5 ingredients that is almost always available in my kitchen: eggs, dashi stock, dried Chinese mushrooms, soy sauce, and salt. Despite its simplicity, this dish is packed with natural flavours. I love its soft, velvety texture too. Step 1 PREPARE STEAM VESSEL: Pour water into the wok and turn on the heat. Step 2 SLICE MUSHROOMS: Soak mushrooms until softened. Slice the mushroom thinly. Step 3 WHISK EGG: Break the eggs into a bowl and beat together thoroughly. Step 4 ADD STOCK: Gradually add dashi stock, stirring constantly. Step 5 STRAIN (optional). Then, using a fine sieve, strain the mixture into another bowl. This step will produce velvety texture. Step 6 ADD SEASONINGS: Add light soy sauce and salt into egg mixture. 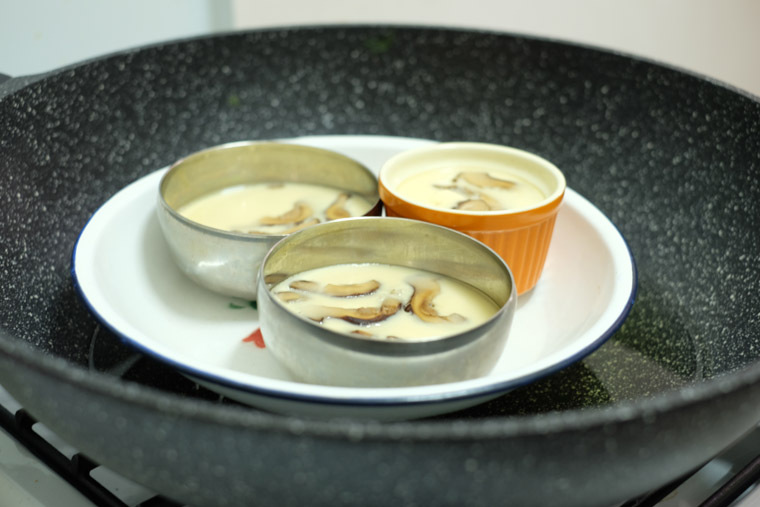 Step 7 ADD MUSHROOMS & EGG INTO BOWLS: Place a few slices of mushroom into each cup. then, slowly pour in the egg mixture. Top each bowls with coriander leaves, if any. Step 8 STEAM: Place the bowls in the steamer. Cover with aluminium foil to prevent water from dripping into the egg mixture. Steam over high heat for 3 minutes. Reduce the heat and continue to steam for 10 minutes, or until set. Whisk 2 eggs. Add 300 ml dashi stock. Strain. Add 1/2 tbsp soy sauce + a pinch of salt. Place sliced mushrooms into bowl. Pour egg mixture into bowls. Steam at high heat for 3 minutes. Reduce heat and steam for 10 min or until set.